Do you have dry skin? You need salt water in your hot tub. Oh, what a feeling! For many hot tub devotees, the way it makes them feel while they soak and afterwards is the essence of hot tubbing. Those beneficial feelings include relieving pain, releasing tension, lessening the effects of arthritis, and others. But not all the sensations are wonderful, especially the dry skin that can result from exposure to hot tub chemicals and hot water. There is a solution, and it is ancient in its origin: Bathing in warm salted water. It was a practice known as thalassotherapy (from the Greek word thalassa, meaning “the sea”) and recommended over 2500-years ago by none other than Hippocrates himself. He observed that fishermen were able to heal quicker, and had fewer infections, when they soaked their injured hands in salt water. No wonder he’s considered the “Father of Medicine”. Hot Spring Spas has taken this “wisdom of the ages’, modernized it, and made it available in their hot tubs. It’s called the Ace Salt Water System and it’s a breakthrough in hot tub water care. The magic of salt water bathing lies in its ability to stimulate circulation, which aids the skin by increasing its capacity to retain moisture. This can reduce the effects normally caused by certain types of hot tub chemicals. Furthermore, an Israeli study in the early 80’s found that salt water soaking helped to reduce the skin scaling and itching caused by dry skin. Salt water also helps to relax muscles, ease pain, and reduce the inflammation of joints and muscles. With the advent of the ACE Salt Water System in 2009, Hot Spring revolutionized hot tub water care. In the last eight years, customers have given it a resounding thumbs up. It truly makes a difference in the quality of the hot tub experience, due to the way your skin feels after soaking. 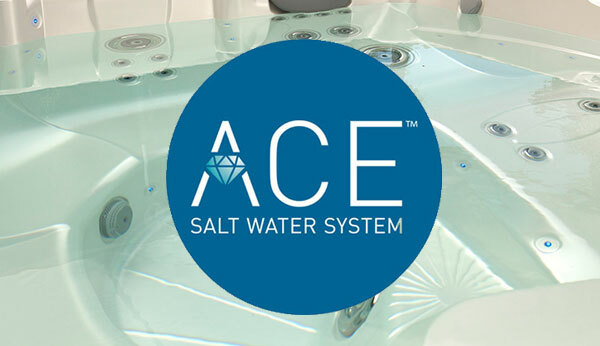 Since the Ace Salt Water System is fully integrated into Hot Spring Spas, and not an aftermarket add-on product, the performance and ease of operation are smooth and seamless. If you’re thinking about a new hot tub, and the idea of soaking in salt water intrigues you, just drop by one of our convenient locations today for a free test soak. You’ll not only learn how easy it is to use the ACE Salt Water Sanitizing System, you’ll be able to experience just how wonderful it feels. The Magic of Music Event…An Extra Special Bonus Through March 19th Olympic Hot Tub is offering a FREE Wireless Bluetooth Music System when you purchase a Hot Spring Highlife NXT, Highlife, or Limelight Spa with our easy, automated Ace Salt-Water System. That’s a $1395 sound system with integrated speakers and subwoofer…for free! It’s called the Magic of Music Event, because music in a hot tub is truly magic, especially when it’s free.